When September 11th happened and New Yorkers started to suffer, you heard two voices. You heard the conventional moralistic voices saying, “When I see you suffer, it tells me about a judging God. You must not be living right, and so God is judging you.” When they see suffering they see a judgmental God. The secular voice said, “When I see people suffering I see God is missing.” When they see suffering, they see an absent, indifferent God. For whatever reason, God chose to make man as he is—limited and suffering and subject to sorrows and death—he [God] had the honesty and the courage to take his own medicine. Whatever game he is playing with his creation, he has kept his own rules and played fair. He can exact nothing from man that he has not exacted from himself. He has himself gone through the whole of human experience, from the trivial irritations of family life and the cramping restrictions of hard work and lack of money to the worst horrors of pain and humiliation, defeat, despair, and death. When he was a man, he played the man. He was born in poverty and died in disgrace, and thought it was worthwhile. The gift of Christmas gives you a resource—a comfort and consolation—for dealing with suffering, because in it we see God’s willingness to enter this world of suffering to suffer with us and for us. No other religion—whether secularism, Greco-Roman paganism, Eastern religion, Judaism, or Islam—believes God became breakable or suffered or had a body. Eastern religion believes the physical is illusion. Greco-Romans believe the physical is bad. Judaism and Islam don’t believe God would do such a thing as live in the flesh. But Christmas teaches that God is concerned not only with the spiritual, because he is not just a spirit anymore. He has a body. He knows what it’s like to be poor, to be a refugee, to face persecution and hunger, to be beaten and stabbed. He knows what it is like to be dead. Therefore, when we put together the incarnation and the resurrection, we see that God is not just concerned about the spirit, but he also cares about the body. He created the spirit and the body, and he will redeem the spirit and the body. Christmas shows us that God is not just concerned about spiritual problems but physical problems too. So we can talk about redeeming people from guilt and unbelief, as well as creating safe streets and affordable housing for the poor, in the same breath. because Jesus himself is not just a spirit but also has a body, the gift of Christmas is a passion for justice. There are a lot of people in this world who have a passion for justice and a compassion for the poor but have absolutely no assurance that justice will one day triumph. They just believe that if we work hard enough long enough, we’ll pull ourselves together and bring some justice to this world. For these people, there’s no consolation when things don’t go well. But Christians have not only a passion for justice but also the knowledge that, in the end, justice will triumph. Confidence in the justice of God makes the most realistic passion for justice possible. Lastly, in the package of Christmas, there’s the ability to reconnect with the part of the human race you despise. Have you ever noticed how women-centric the incarnation and resurrection narratives are? Do you realize that women, not men, are at the very center of these stories? For example, in the story of the resurrection, who was the only person in the world who knew that Jesus Christ had risen from the dead? Mary Magdelene, a former mental patient, is the one Jesus tells to take this news to the world. Everyone else in the whole world learns it from her. Women are the first people to see Jesus risen from the dead. In the incarnation, the annunciation comes to a woman. God penetrates the world through the womb of a poor, unwed, Jewish, teenage girl. The first theological reflection group trying to wrap their minds around this to figure out what this means and what is going on is Mary and Elizabeth. We know that in those days women had a very, very low status. They were marginalized and oppressed. For example, we know that a woman’s testimony was not admissible in court. Why? Because of prejudice against women. There’s a place in one of Martin Luther’s nativity sermons where he asks something like, “Do know what a stable smells like? You know what that family would have smelled like after the birth when they went out into the city? And if they were standing next to you, how would you have felt about them and regarded them?” He is saying, I want you to see Christ in the neighbor you tend to despise—in the political party you despise, in the race you despise, in the class of people you despise. Do you remember what an incredible snob you were when you were a teenager? Teenagers generally want nothing to do with people who don’t dress right and look cool. Do you think you ever got over that? You’re not really over that. You just found more socially acceptable ways to express it. You see, teenagers let that aspect of human nature out and don’t realize how stupid they look, and after a while they get rid of it. But really they are just papering over it. There are all kinds of people you look down on and want nothing to do with—and you know it. But in Christmas you have this amazing resource to decimate that—to remove it and take it away. These are the gifts that come in the package of Christmas— vulnerability for intimacy, strength for suffering, passion for justice, and power over prejudice. And you are blessed if you open this gift and take it into your life. If you do, you’ll be blessed. You’ll be transformed. 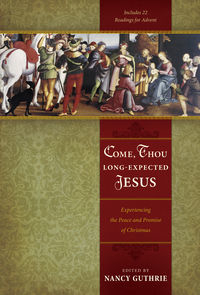 SOURCE: This adapted sermon is an excerpt from Come, Thou Long-Expected Jesus: Experiencing the Peace & Promise of Christmas. Edited by Nancy Guthrie, Crossways. Copyright © by Timothy Keller, 2007.